Some things are already on the calendar, others need to find a date. Make sure you come out to tour Fanatic Brewing in January and come Ice Brew in February. Help Tom pick a date for the cider event by filling out this poll. Submit your lagers for an informal bragging rights competition here. We can’t let Peed keep that cool stein! Expect to gather on February 27th. 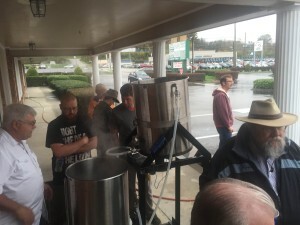 Despite the forecast of cold and rainy we had about 15-20 club members swing by and about a dozen lookers, several of whom stayed for some time and asked great questions, attend this year’s Learn to Homebrew Day. We broke in the club’s new system and ran into some issues, but nothing that we couldn’t fix. We tried to brew 5 gallons of Mike Caylor’s mild recipe but the boil off rate got the better of us and we ended up with a little less than 4 gallons of imperial mild. We also made a successful extract batch of american pale ale. Thanks again to FermentStation for donating the ingredients, space, and some tasty snacks! Time for a fall water analysis. Club will pay approximately half the cost (including shipping) for the Ward Labs Brewing Water Analysis of your water. Your cost will be $15. If you want to participate, please sign up here. Let’s try not to duplicate sources (no point in that unless there’s some valid reason/you want to double check/whatever). Please bring your water sample to the club event this coming Saturday, Nov 7, at Ferment Station. The event is Learn to Homebrew Day. 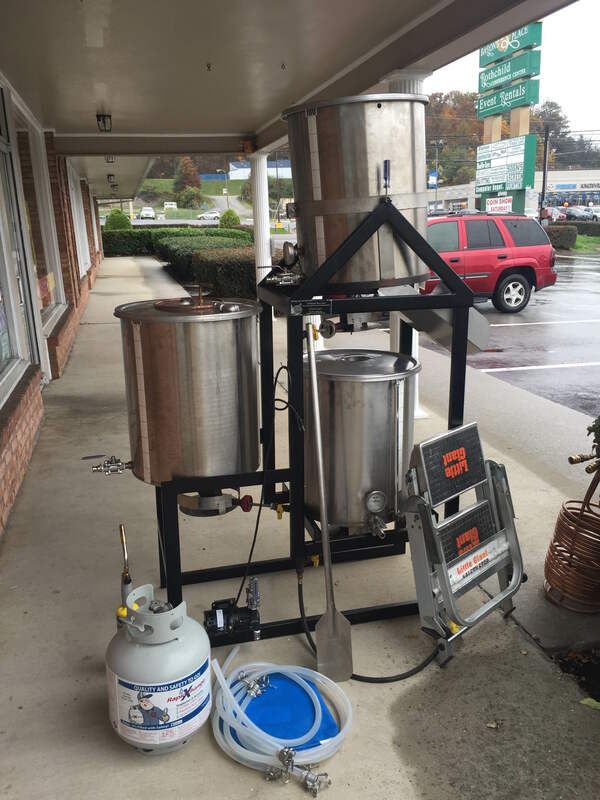 If all goes well, we’ll do an inaugural all-grain batch on the refurbished club brewing system. We’ll also be doing an extract batch. If you can’t make it to that event, please make arrangements to get your sample to me by the end of this week (I work near the “corner” of Pellissippi and Dutchtown). Thursday October 15 at 6 PM — Pretzel Jam at Everything Mushrooms (1004 Sevier Avenue). Bring home brew to share. Club will order pizza. This is where you get your shirt and Jam pass. Friday October 16 at 3 PM — Beer receiving, beer drinking, and general hang out time at the World’s Fair site. Bring some homebrew, a lawn chair, and other amusements. Bring your beer for the Jam. We stick around until 7ish to receive beer from the brewers bringing their own. After that, we’re invited to the brewer’s party on the 5th floor of Downtown Grill and Brewery. Saturday October 17 — Morning shift need to be there by 10 AM, 9 AM if you can. Afternoon shift starts at 2 PM. Please be willing to help out with what you can do when someone asks. The period from 10 AM until 1 PM (when gates open) is the busiest. If you are not able to attend the Pretzel Jam, it is up to you to figure out when and where to get your shirt and Jam pass. Friday afternoon is the next best time/place. Saturday is hectic. If you can’t be there Thursday or Friday, let me or Stevo know. We might do a specific time and place on Saturday morning. Very early on Saturday, no one is checking for wristbands, but by 11 AM you can’t get in the gate without one. We just added a club event to the calendar for just a few weeks from now. Short notice, but that’s the way this plan came together. Check it out! Sign up to RSVP and bring some food HERE. We have set the dates for Wednesday, June 17 at 6:30 PM and Tuesday, June 23 at 6:30 PM in the back room of the Hardin Valley Casual Pint. These are club-wide events, so come on down! Participants please bring a growler to share. Don’t forget your brewing notes and please fill out the form on google docs. Everyone can check the stats here. Thanks to everyone that made the 2015 Homebruin Cup a success. We had over 30 total participants this year! For the second year in a row Michael Caylor took Best Of Show honors. The winning beer was an English Mild that clocked in at only 3.8% ABV. Runner up was a Hefeweizen brewed by Christopher Long. Congratulations to them and to all the other medalists. Full results are posted here. I’ve been following this blog for a while and I really like the guy’s approach to experimenting around brewing. A few of his experiments have really been eye opening for me. I was quite interested in the results of the trub v. no trub experiment especially because I use Dennis’s hop stopper and as such all the cold break ends up in my fermenters. This last set of experiments about fermentation temperature just blew my mind and I thought I’d share. I can’t wait for the Dr. Homebrew episode. I want to hear the BJCP judges talk about these beers. I didn’t know this. Did you? 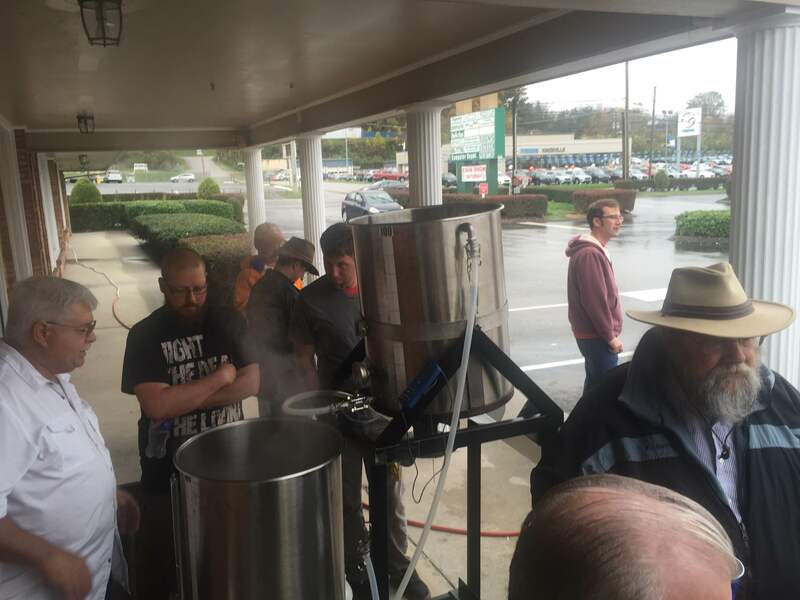 Thanks to everyone in the club that made the Learn To Homebrew Day event such a great success. Casual Pint Hardin Valley was a phenomenal host on a day where the weather was anything but cooperative. We persevered through the cold and brewed a batch of Nut Brown Ale and an Irish Red Ale with about 30 people in attendance. I can’t wait to sample the fruits of our labors! Check back here for details in the coming weeks.